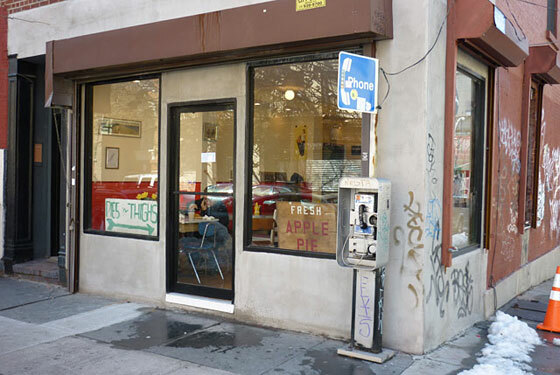 Pies ’n’ Thighs, the city’s most eagerly awaited Southern-fried grease trap, has kept Williamsburg in Pavlovian limbo since the start of 2008, when its first incarnation—a drunk-food closet at the back of a bar—was shut down to prep for a more spacious and permanent home. Last month, after endless delays, it finally debuted in a former bodega near the Williamsburg Bridge. The new version, run by the three chefs behind the original—Carolyn Bane, Erika Geldzahler and Sarah Buck, who met working at Diner—is a full-fledged restaurant with prompt, personable waiters and beer and wine service. Still, the place retains the DIY, seat-of-the-pants spirit of the dive that it sprang from, with food specials scrawled on sheets of paper, chairs and tables that might have been salvaged from a public school, and overhead lights so bright, dining there feels like sitting in detention.